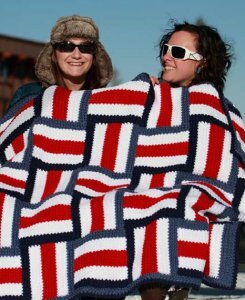 This easy crochet pattern uses 35 squares and alternating striping to create a cool effect on a very warm and cozy blanket! This Snowboarder's Throw pattern is one of our FREE Stitch Mountain patterns! Size US H & G crochet hooks (or sizes needed to obtain gauge) are required but not included. Finished Measurements: about 45" wide x 60" long after blocking. Gauge: 18 sts over 4"